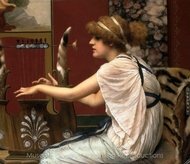 John William Godward was an English painter from the end of the Pre-Raphaelite / Neo-Classicist era. 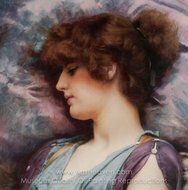 He was a prot�g� of Sir Lawrence Alma-Tadema but his style of painting fell out of favour with the arrival of painters like Picasso. He committed suicide at the age of 61 and is said to have written in his suicide note that "the world was not big enough" for him and a Picasso. His already estranged family, who had disapproved of him becoming an artist, were ashamed of his suicide and burned his papers. No photographs of Godward are known to survive. 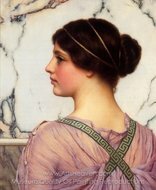 Godward was a Victorian Neoclassicist, and therefore a follower in theory of Lord Frederic Leighton. 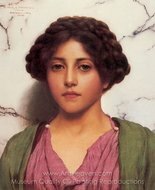 However, he is more closely allied stylistically to Sir Lawrence Alma-Tadema, with whom he shared a penchant for the rendering of Classical architecture, in particular, static landscape features constructed from marble.